This is a ride that allows you to fully traverse two of the scenic backcountry roads deep in the East Bay hills. The ride is a loop that essentially takes you from the outskirts of Livermore to the outskirts of Tracy and back. The route is one that I've practically picked from a map. Twice traversing the treeless, grassy hills between Livermore and the Central Valley in pretty, open backcountry seemed like a sure shot at a peaceful and pleasant ride; and it is for the most part, though the ride is not without its flaws. One difficulty is in connecting the loop on the Central Valley side. What you see on this page is the least bothersome routing I could find in order to do that, though it's not a pleasant experience to ride on some of the pancake-flat and ruler-straight roads of the Central Valley through semi-industrial areas and the relatively heavier traffic in those parts. Another factor that took a little away from the ride's enjoyment was the fact the later (eastern) parts of Tesla Road have fairly fast traffic. Some stretches of this road have a 55 MPH speed limit. I don't remember noticing the first speed limit sign showing 55 at any point before the last mile and a half before your first crossing of Interstate 580, but even some of the earlier stretches of Tesla Road around Carnegie SVRA (where the speed limit is 45 MPH) are straight enough that many drivers drive pretty fast. On a two-lane road with hardly any paved shoulder space, this doesn't result in a comfortable experience for cyclists. Thankfully, this condition doesn't last long enough to mar the whole ride. The ride features two climbs. The first of these, arriving on Tesla Road, isn't very serious. If you're in any decent shape, it will be over just as you are getting warmed up. The second climb is a tough one, going over Patterson Pass on its namesake road. This latter one is a climb that's very well known to cyclists of this area and is also the setting of an annual road race to which it gives its name. I'll get into more specific descriptions of the climbs below, but just keep in mind that it's worth saving your energy for this later climb on the ride. I don't have a strong preference in terms of the direction in which to traverse this loop. Doing it counter-clockwise as I show here means that your climb on Tesla Road will be substantially easier than it would have been in the opposite direction. 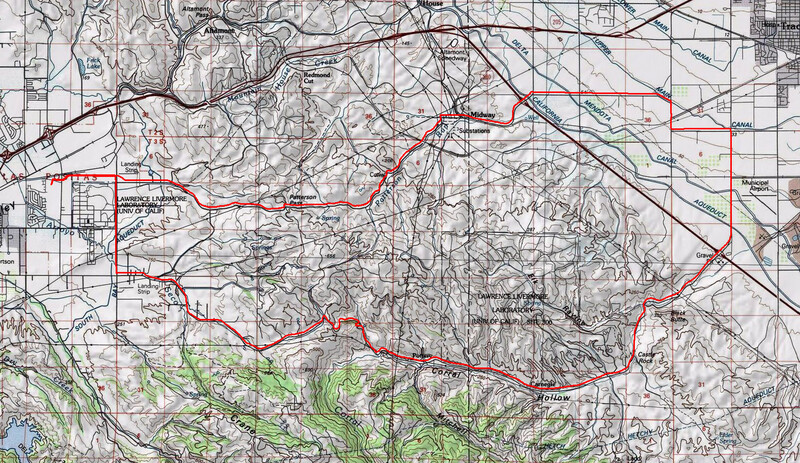 However, that comes at the cost of doing the Patterson Pass climb in the slightly tougher direction. The difference for Patterson Pass isn't very much, but approaching it from the east involves more net elevation gain (though that additional climb is in the gentlest part) and a bit steeper slopes in at least one stretch near the top of the climb. Perhaps more decisive for some riders will be the fact that there's a 12-mile stretch of the route that takes place at minimal but very steady grades of 1 to 1.5 percent (with one interruption around I-580). This stretch will be a long, gravity-assisted cruise if you're looping counter-clockwise, and a long, low-key pedaling workout if you're doing it clockwise. As the starting point for this ride, I picked a suburban street on the outskirts of Livermore. This means the route involves a short "stem" that you use as the approach and return from the ride's main loop. Part of this takes place on the part of Patterson Pass Road that's in the form of a wide suburban avenue with a wide, paved shoulder, and with what looks like a small industrial park on one side and the boundary of the Lawrence Livermore National Labs property on the other. At its intersection with Greenville Road, you turn off Patterson Pass Road for now to follow the former along a straight segment (also skirting the Lawrence Livermore Labs lands) to get to Tesla Road. Tesla Road road begins in the form of a grassy backcountry road passing by a few ranches, and gets progressively more deserted after that. The road slowly begins to feel like a climb only about 1.5 to 2 miles after you get on it, with the grade beginning to occasionally exceed 4%. Grades around 7% become more persistent only in your 9th mile, and the significant part of this first climb of the ride lasts for less than a mile and a half. The slopes on Tesla Road are quite consistent, but not without short, gentler breaks that act as nice breathers. Tesla Road is surrounded by softly rolling, grassy hills, with sprinklings of oak trees in some areas. This entire area is simply gorgeous during the few months of the year when the grass is green, and is peaceful feeling even outside of that brief period. That pretty setting acts as a nice backdrop to the curvy descent that starts with a bang shortly after the nine-mile marker of the route. This two-mile descent is a fast and pretty one, averaging nearly -8.5% grade end to end, and topping out at around -10% in one short stretch. Multiple things change at or near the bottom of that nice descent on Tesla Road. The first of these is the fact that the ride's 12-mile nearly (but not quite) flat stretch begins here. You also reach the Carnegie State Vehicular Recreation Area a few moments after this. This ATV and motorcycle park along with its scarred hills accompany you for more than 3.5 miles after this. At the same time, the road's name changes from Tesla Road to Corral Hollow Road as you cross over from Alameda County to San Joaquin County right around this spot. This is also the beginning of the much straighter portion of this road, with faster and somewhat heavier traffic, as I've mentioned above. The scenery becomes less pretty as you cross I-580 on Corral Hollow Road and try to find your way to Patterson Pass Road. You make a few right-angled turns on these straight and flat roads that skirt the outer neighborhoods of Tracy. There aren't too many opportunities to get lost around here, but the route you need to follow doesn't necessarily feel very natural either. So, it would be a good idea to make a good note of the turns you'll need to make, unless you'll be following someone or a mapping device. Just as you're heading out of the flat lands of the Central Valley and heading back into the hills, the route also takes you right through a particularly dense cluster of industrial facilities that include Safeway, Costco, and Amazon distribution centers among other things. As soon as you cross I-580 for the second time, you will be on Patterson Pass Road and the change of the scenery back into a backcountry setting is almost as abrupt in the change in the road's name. Shortly afterward, you pedal past a large electric substation that serves as the last reminder of nearby industry. Beyond that, it's just the open hills as the slope begins to pick up immediately but slowly. The setting of Patterson Pass Road is essentially the same as that of Corral Hollow / Tesla Road, as you might expect. It's just that the traffic is much lighter on Patterson Pass Road, since it doesn't lead to anything like the Carnegie SVRA that would act as a traffic draw. The slope on Patterson Pass Road begins to get serious for the first time only about 1.5 miles after you pass by the substation. This is where the first stretch arrives where grades reach around 9%, and the beginning of a 1-mile section that averages just under 7% grade end to end. Following that one mile, the grade slackens for about half a mile to give you a nice break as the road traces one long and unbroken curve. That's a very good thing, because you'll need to put in some serious muscle over the next quarter mile or so that follows this short break. This steepening quarter mile ends at the "false top" that you encounter on your way up to Patterson Pass and possibly includes the climb's steepest spot, topping out at around 15% grade. The last 200 yards of this stretch averages a grade that exceeds 13%. Thankfully, the false top is followed by a quarter mile stretch that's flat and even allows you to coast a little. It gives you a chance to catch your breath. The reason this is called a "false top" will be fairly obvious as you complete this steepening, tough stretch with hopes that this is taking you to the top, since no higher ridges or hills are visible beyond the climb as you're heading up, when the rest of the climb to the pass suddenly comes into view as you crest the top. Thankfully, other than one short and steep blip, the rest of the roughly one-mile climb to the actual pass starts out relatively gradually. This is also a stretch where Patterson Pass Road narrows down considerably and starts twisting almost erratically, and signs announcing "pedestrians not advised" begin to show up. This stretch is effectively what makes the Patterson Pass climb memorable and, from what I understand, this is the direction of climb to the pass that most cyclists refer to when they talk about "climbing Patterson Pass". At the very least, this appears to be the direction in which the Patterson Pass Road Race course typically does the climb. The last bit of the climb is the steepest, which is almost as bad as the climb to the false top but perhaps a hair easier, with the final 150 yards or so before the pass averaging around 13.5% grade. Once you reach Patterson Pass, make sure to turn around and take in the view. This should come naturally since this is such an instinctive rest stop after such a hard climb. You'll see windmills covering the nearby bare, grassy hills and the narrow road you've just climbed twisting somewhat wildly as it heads away from you in a long descent across completely open scenery. Beyond the foreground hills, the flat expanse of the Central Valley is clearly visible. A discussion of Patterson Pass may not be considered complete without touching upon safety. It appears that this road is known for bad accidents. I read that this is mainly due to its use by commuters who are trying to avoid the congested I-580. The higher elevations of Patterson Pass Road are almost narrow enough to be a single-lane and they are curvy. The riskiness of this stretch is made evident by the "pedestrians not advised" signs I've already mentioned and at least one sign in the eastbound direction that prohibits passing for seven miles. The only times I ever rode through Patterson Pass were on Sunday mornings and the road had very little traffic in those cases. Perhaps, that might be the safest approach for this ride in terms of traffic: save it for a weekend. The descent on the other side of Patterson Pass starts out fairly fast, since, for at least the first mile or so, you'll be descending slopes that are the equivalent of the ones you've climbed on the way to the peak. Overall, you might not have to pedal at all for nearly three miles after the peak. The scenery is not very different, except for the ranches that will begin to pop into your view and the distant view of Livermore in the background.